Most of us are the foreigners, the non-Israelites, about whom today’s First Reading prophesies. Coming to worship the God of Israel, we stand in the line of faith epitomized by the Canaanite woman in today’s Gospel. Calling to Jesus as Lord and Son of David, this foreigner shows her great faith in God’s covenant with Israel. 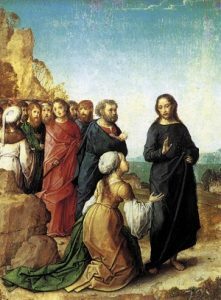 Jesus tests her faith three times. He refuses to answer her cry. Then, He tells her His mission is only to Israelites. Finally, he uses “dog,” an epithet used to disparage non-Israelites (see Matthew 7:6). Yet she persists, believing that He alone offers salvation. In this family drama, we see fulfilled Isaiah’s prophecy and the promise we sing of in today’s Psalm. In Jesus, God makes known among all the nations His way and His salvation (see John 14:6). In God’s plan, Abraham was to be the father of many nations (see Romans 4:16-17). Israel was to be the firstborn of a worldwide family of God, made up of all who believe what the Canaanite professes— that Jesus is Lord (see Exodus 4:22-23; Romans 5:13-24). Jesus came first to restore the kingdom to Israel (see Acts 1:6; 13:46). But His ultimate mission was the reconciliation of the world, as Paul declares in today’s Epistle. In the Mass we join all peoples in doing Him homage. As Isaiah foretold, we come to His holy mountain, the heavenly Jerusalem, to offer sacrifice at His altar (see Hebrews 12:22-24,28). With the Canaanite, we take our place at the Master’s table, to be fed as His children.